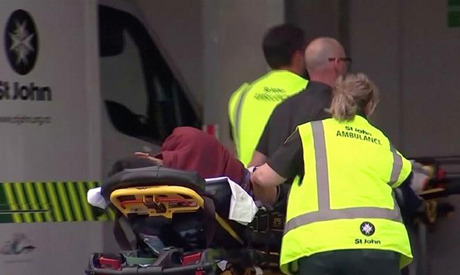 Four Egyptian nationals were among the 49 victims of mass shootings at two New Zealand mosques on Friday, Cairo has said. Minister of Immigration and Expatriate Affairs Nabila Makram, in cooperation with the Egyptian Ambassador to New Zealand Tariq Al-Wasimi, made the announcement on Sunday, according to a ministry statement. Al-Wasimi said that the Egyptian mission had communicated with the relevant New Zealand authorities and been told that there were four Egyptian dead, whose bodies were in the hospital. The embassy has contacted their families. The four, all male, were named by the ambassador as Munir Suleiman (68 years old), Ahmad Jamal al-Din Abdul-Rahman (also 68), Ashraf Morsi, and Ashraf Al-Masri. The ages of the latter two victims were not stated. Forty-nine people were killed and twenty injured after gunmen opened fire at the two mosques during Friday prayers. The New Zealand authorities described it as a terrorist attack. A suspect appeared in court on Saturday morning charged with murder. The Egyptian ambassador added that the nationalities of the injured had not yet been confirmed. He said that measures have been put in place to assist the families of the victims, and burials are expected to begin on Tuesday. Makram said in the statement that the New Zealand government had allocated a website to register missing persons from the event as follows: https://familylinks.icrc.org/new-zealand/en/Pages/Home.aspx. The associated phone number is 0800 115 019 or +64 3 353 4532 for international calls. She also confirmed the presence of a specialist team in Christchurch from the embassy. The New Zealand government announced during a conference this morning it is prepared to transfer the bodies of the victims to their country of origin. The ministry is also able to receive inquiries from the families of the missing in the incident via e-mail. These inquiries will be sent directly to the Egyptian Embassy in New Zealand. The e-mail address is: Egyptiansabroad@emigration.gov.eg.